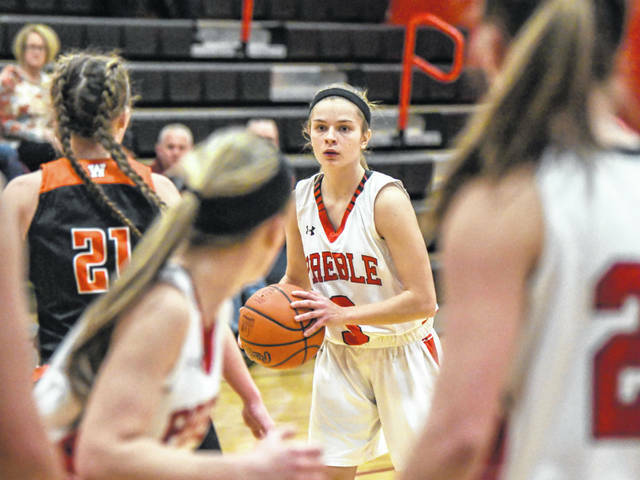 Preble Shawnee’s Logan Hollon has played a key role for the Arrows this season. The senior has helped guide the team to a 15-6 record after recording three wins last week. 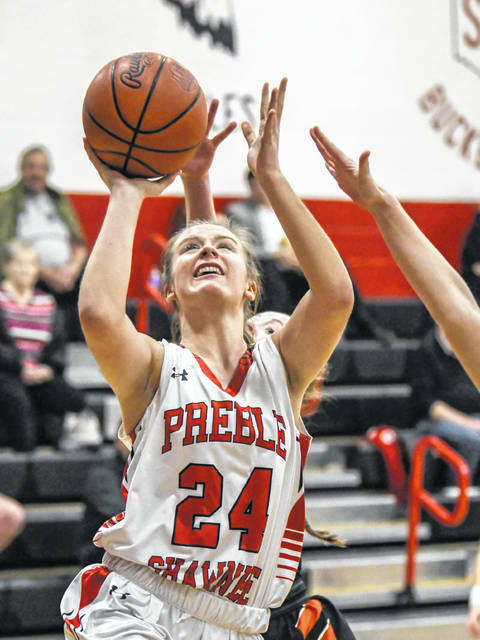 CAMDEN — Preble Shawnee’s girls basketball team continues to rack up victories. The Arrows went 3-1 last week and have now won nine of their last 10 games. 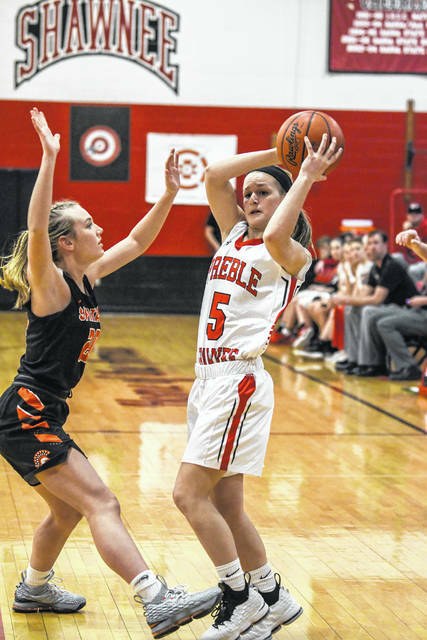 The only loss during that stretch was to league champion Waynesville. Shawnee began the week with a 37-35 win over Fenwick on Monday, Feb. 4. 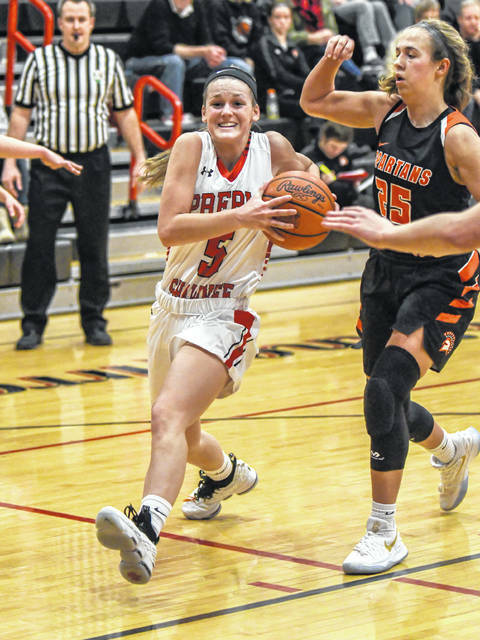 Jenna Lovely led the way with 13 points and 4 steals and everyone else chipped in with 4 or 5 points, according to Schaeffer. 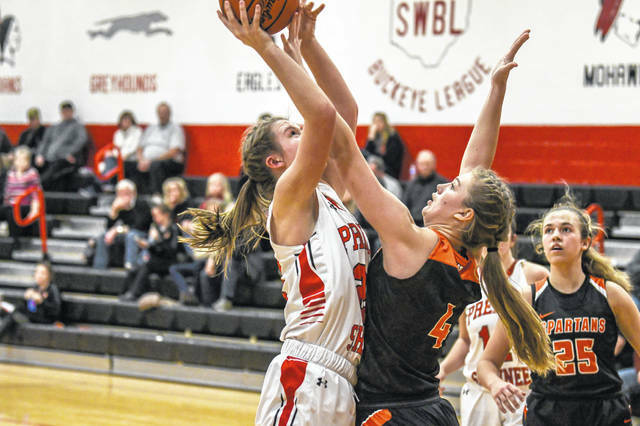 On Tuesday, Shawnee had a chance to more into a first place tie in the Southwestern Buckeye League’s Buckeye Division with a win over Waynesville. 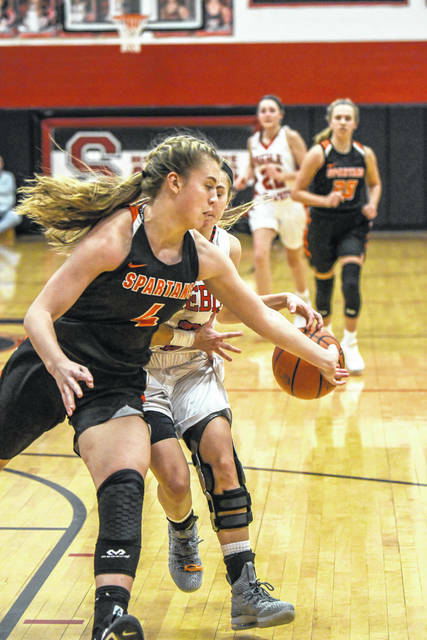 But the Spartans proved to be too much and handed Shawnee a 49-32 setback. This was kind of a “welcome to the show” game for Hollon, according to Schaeffer said. “She went toe-to-toe with the best post player in the league and gave as good as she got. 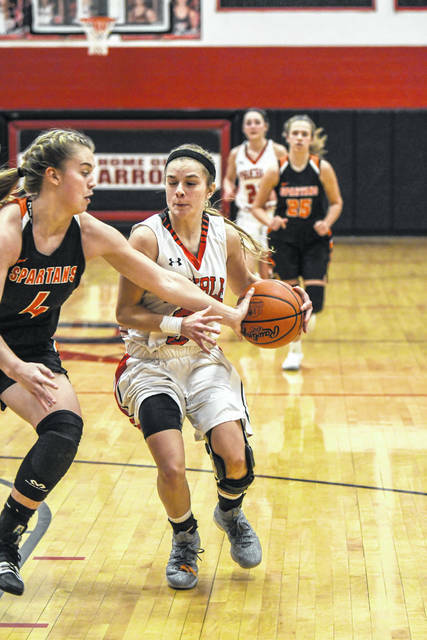 If we can get her playing as aggressively and intently as she did in the second half, we will be a tough out for anyone in the state,” he said. On Thursday, the Arrows traveled to Eaton for a rivaly game. The Arrows we on their heels much of the first half and trailed 27-8 at the half. But a strong second half rally propelled Shawnee to a 50-45 overtime win. “Oh my. This was a disaster from the get go. 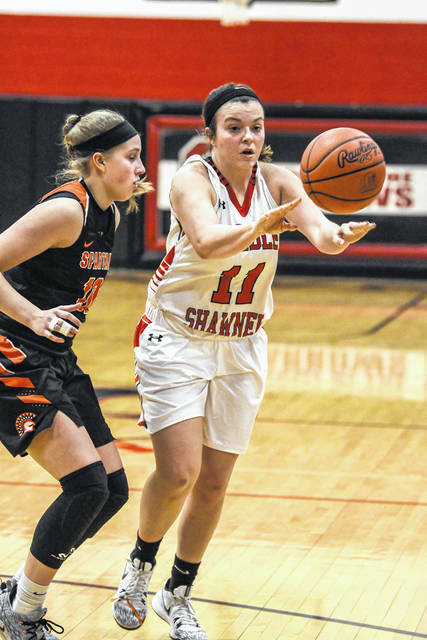 It was the worst half of basketball we have played in the three years of my tenure at Shawnee,” Schaeffer said. “We just weren’t there. Didn’t bother to show up. At half, we were down, and embarrassed, 8-27. After a spirited half time discussion in the locker room, I challenged the girls to show a little Shawnee pride. And that they did. We changed very little strategically. Ran the same defense and press as we showed in the first half. We rallied to win the second half by a total of 42-18 and escaped with a 50-45 overtime win. Lovely led the way with 14 points, followed by 12 and 10 respectively for Hollon and Sims. Woodard chipped in with 8, which included banking in a 3-pointer with 11 seconds left in regulation and force overtime. Shawnee wrapped up the week with a 48-32 win over National Trail on Saturday. The win gave the Arrows a 4-0 record against county teams. 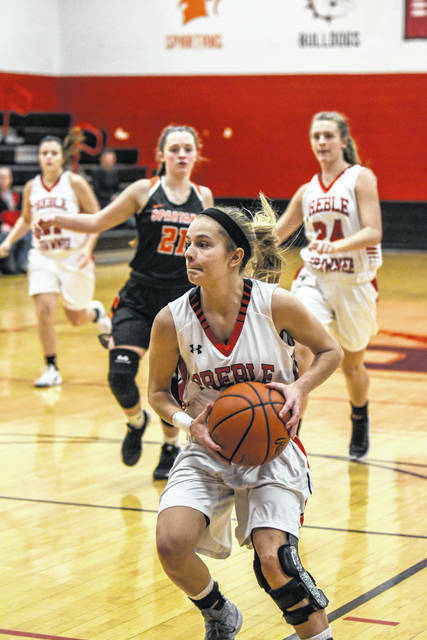 Shawnee (15-6, 9-2 SWBL) was scheduled to close out the regular season with a trip to Milton-Union on Monday, Feb. 11.
https://www.registerherald.com/wp-content/uploads/sites/41/2019/02/web1_PSwbbvsWaynesville91.jpgPreble Shawnee’s Logan Hollon has played a key role for the Arrows this season. The senior has helped guide the team to a 15-6 record after recording three wins last week.